Phnom Penh, the capital of Cambodia is with lot of unique views and attractions. It is not a completely clean city where you will not see any dirt. Instead this city shows signs of similar Asian countries which are not developed. However we had exciting 3 nights stay in Phnom Penh without many worries experiencing the difference in culture, views and attractions. Well, our trip to Cambodia is well planned though we didn’t visit the most popular Siem Reap attractions. 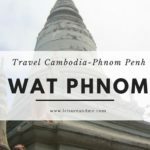 We decided to visit only Phnom Penh simply because we had 3 days for the holiday. Still we have plans to visit Siem Reap in near future. 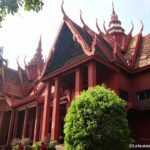 As another Asian country, I absolutely like our stay at Phnom Penh though there are strange experiences and views than we expected. Below are some experiences and impressions I want to note down here which I found as unique to this simple city of Cambodia. Anyway I don’t have any intention to make this as a fun post or to laugh at people of Cambodia. 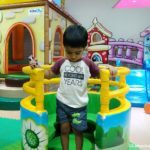 Instead these are the moments that made me feel like I am in another destination which made me exciting! Cambodia offers visa on arrival facility for some selected countries. As Sri Lankans we require visa to enter into Cambodia, Phnom Penh. Though we can use the facility of Visa on arrival, we applied for our Cambodia visa before we travel. I think we were lucky. As I noticed it was crowded for visa on arrival service. We saw people waiting at the immigration area for their visa. It is true that anyone wants to reach the hotel or destination when they are in a new city than waiting in a long queue. In such, if you require visa for Cambodia, plan it before arrival or get ready for a long line. 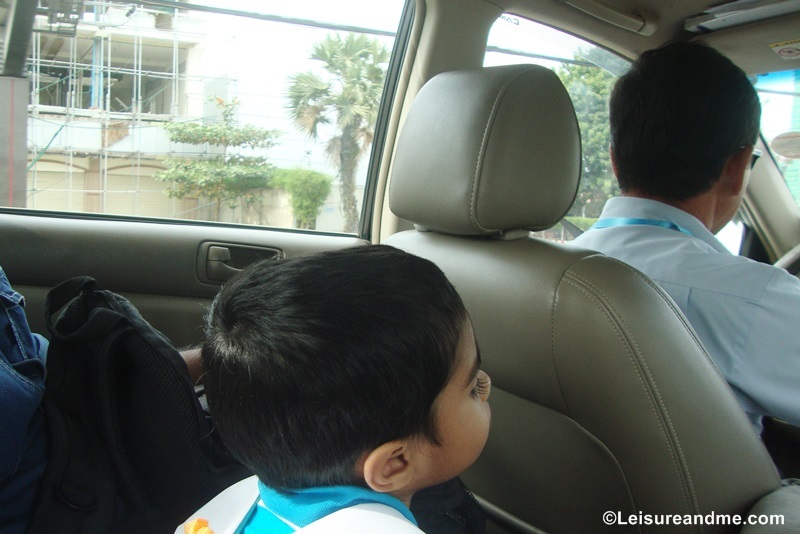 Once we are in Phnom Penh airport, it was really easier to hire a taxi to the hotel we stayed. For a car the rate is around $9 within the city area. The car driver was friendly and helpful. He talked with us and was helpful for planning our tour schedule giving us some ideas about the attractions. Something I noticed while we were in the car was that in Cambodia they use cars which steering wheel is on the left side of the car. It is new for me as I am familiar with the car drives with right side steering wheels. Phnom Penh is not one of the most cleaned cities I’ve seen. There is garbage along the roads and it can be too hot during the day time. Other than this I noticed their overhead cables. Those are so massive and lots of overhead cables are exposed along the road. Narrow streets are so packed with vendors and shops. Other than that sometimes there is no space to walk. If you plan to bring your stroller with the kid, I must say that Phnom Penh streets are not stroller friendly. But, you can use strollers in some attractions such as Royal palace garden or for your river sidewalk. You will see beautiful decorated Tuk Tuks in Cambodia,Phnom penh. 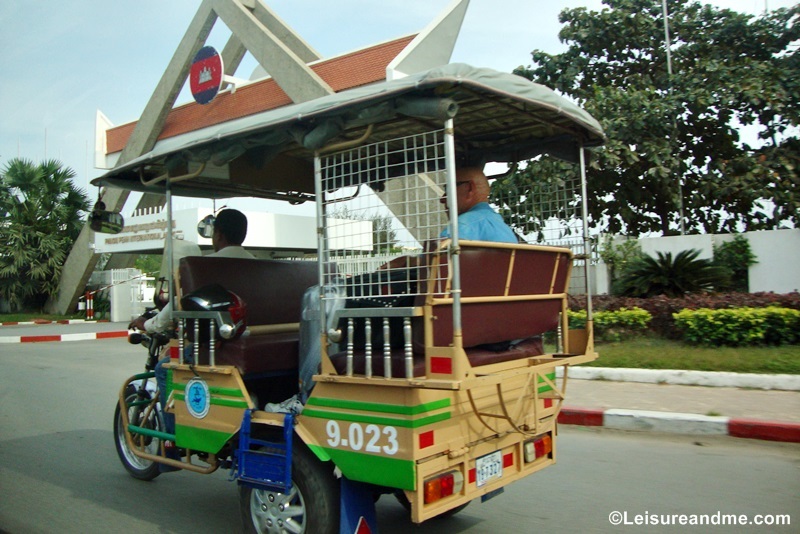 While there are different transport options are available in Phnom Penh, Tuk Tuks are much popular. 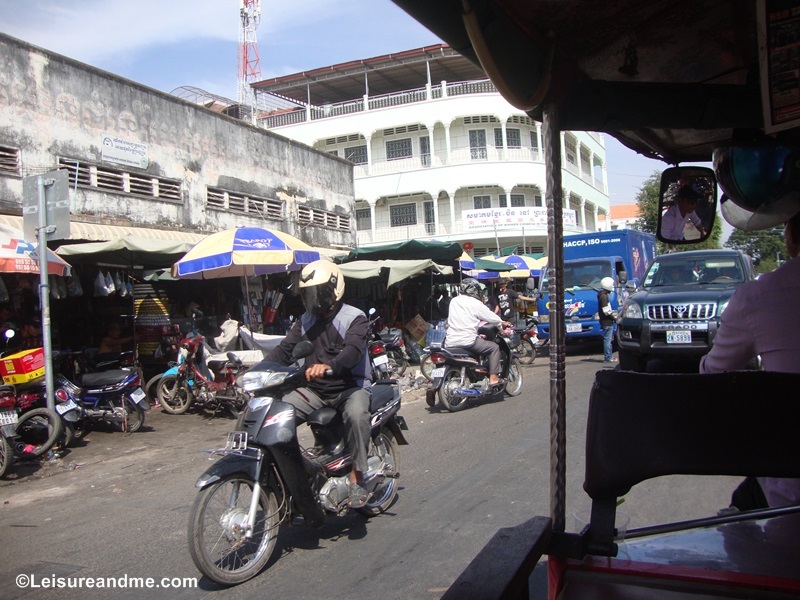 I really like these tuk tuk rides while watching the streets, city views and people of Cambodia. These tuk tuks are beautiful decorated and some are well maintained. We saw many tuk tuks along the streets parked till a customer request a ride. 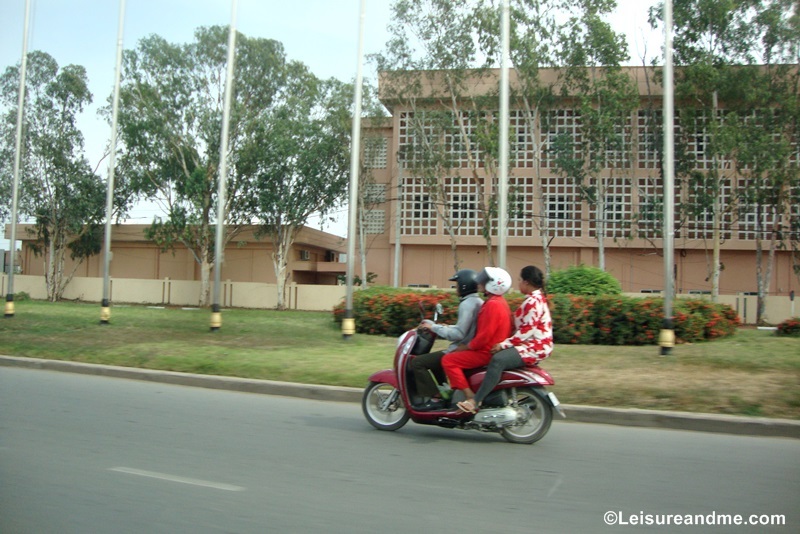 Other than tuk tuk rides, it seems motor bikes are one of the popular ways to travel for the people in Phnom Penh. There are lots of scooters around the city. In the evening traffic jam was so much higher and we saw lot of scooters which is an unusual compared to the cities we have travelled before. We can’t forget the friendly people from Phnom Penh. They are extremely polite. They smile easily. We had the feeling of staying in a long time familiar country though we stayed just 3 nights there. 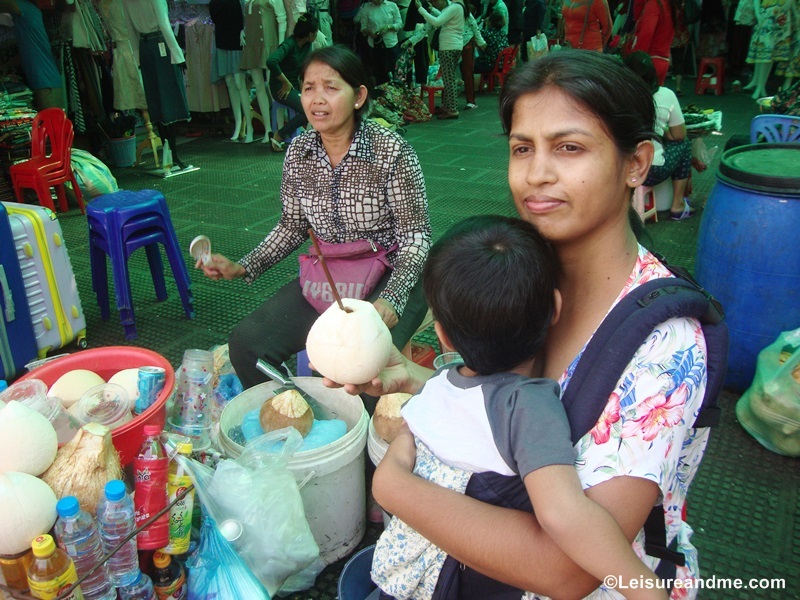 I had opportunity to talk with this local vendor while tasting a young coconut at the Central Market of Phnom Penh. 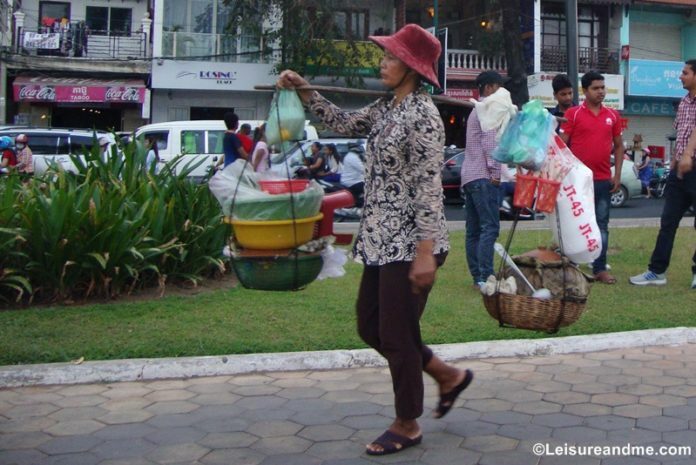 In the streets you will also notice street vendors who sell different stuff including the street foods. 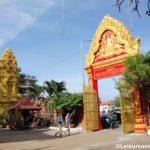 Local markets are so much popular and these places are the best to experience the culture and lifestyle of Phnom Penh. Other than local markets, we also visited Buddhist temples. We also can’t forget the Opportunity to talk with Buddhist monks in Phnom Penh. 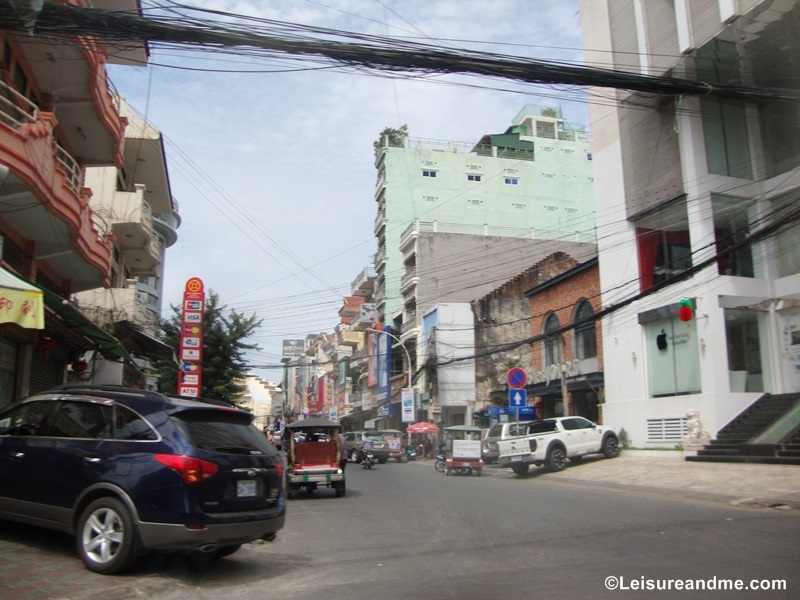 My first impressions of Phnom Penh are different from other cities we have visited before. Phnom Penh is a city with friendly people, both rich and poor. City views are with both clean and dirt. But it is a fantastic city. Country is rich with heritage cities, historical attractions and culture. If you plan a visit to Cambodia or Phnom Penh, don’t think twice. 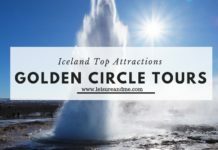 As a traveler you will really enjoy the different experiences there! Have you been to Cambodia or Phnom Penh before? Or how do you experience your first visit to any city?Please share your thoughts below. It’s so interesting to see how people live around the world. It makes me grateful for my clean city with wide open spaces and few crowds. Big crowds and busy streets are still full of great people, though. I just love my wide open spaces! 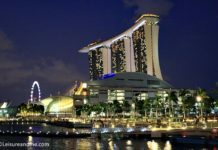 yes,true.Living in Singapore,one of the cleanest cities around the world,I always feel the difference when we visit such places. I love the colourful tuk tuks! I noticed the mom wearing her child; it sounds like the best way to take a little one around the area if it isn’t stroller friendly. This looks like an exciting city. I’ve never been to this area before. I’d be eager to check out the street vendors. Street vendors are really interesting to see in Phnom Penh. I have never been there before. It seems like you made the best of your 3 days. It’s always nice to travel and see how another place lives. yes,we had great time in Phnom Penh experiencing the difference in culture and lifestyle..
Phnom Penh seems warm and friendly from your words. I was at Siem Reap and there too I had similar experience. I like how you chat up with locals. It is best to soak in the city we visit rather than running around to cross off sights. Oh wow, Cambodia is next on my travel list. I was suppose to visit last month but prioritized Indonesia. I am scheduled to visit early next year. It’s always fascinating to see other parts of the world – I haven’t been to Cambodia but it’s on my wishlist along with Vietnam. 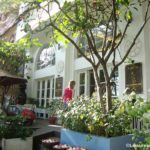 I have been to Bali and there appear to be many similarities – especially the popularity of motorcycles! ? It looks like you had a wonderful time in Phnom Penh. I love that the taxi driver offered you some advice for your sightseeing! 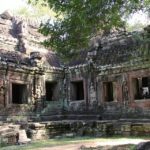 I have never even thought about visiting Cambodia but this post is making me rethink that! The visa process sounds like a real pain, can one get a visa before they arrive? i would love to visit! definitely adding this to my bucket list 🙂 gorgeous photos! That’s interesting that they drive on the left! We wanted to visit. We wanted to go to Angkor Wat while in the area as well. That trip was cancelled for us though and I’m not sure we’ll get to go at this point. How lovely to see your impressions of Phnom Penh. When visiting another country where I don’t speak the native language, I prefer to go with someone who does or follow a tour. I am not that adventurous and prefer to learn the local facts from a guide or a local.